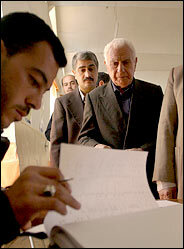 Iraqis went to the polls today to elect a new government. As I write this, the polls are just closing. I feel very strongly about this, and in my own small way, I want to show my solidarity. For me it's a simple gesture -- a moment with a purple ink-pad and a digital camera -- certainly not in the same league with the millions of brave Iraqis who are putting themselves at risk today to build a better future for themselves and their children. But it's a way to show my support. Looks about like any American polling station on election day, doesn't it? Over the last couple of days, Iraqi expatriates made the pilgrimage to a makeshift polling place on Niles Center Road in Skokie. 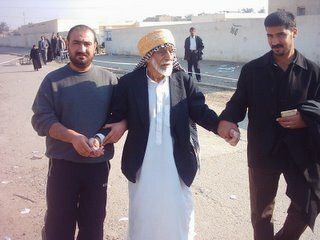 They came to vote for Iraq's future. They drove or flew from Nebraska, South Dakota, all over the Midwest. And of course many came from Chicago. They lined up early and eagerly to cast ballots for some of the 7,000 candidates vying for 275 seats in the new Iraqi parliament--the first government forged under the country's recently ratified constitution. They know what's at stake: everything. The BBC, much to my surprise, has a relatively upbeat collection of opinions from around the Arab world. The Omani newspaper OMAN, for example, said: "It is not an exaggeration to say that today is a historic day for the brotherly Iraqi people... We sincerely hope that all Iraqis will take part with enthusiasm and without hesitation in today's elections for the sake of a better Iraq, and more importantly to preserve the territorial integrity of Iraq and the unity of its people and society." What a beautiful sight! These are voters in Barwana, once a stronghold of Zarqawi and his thugs. They're waiting patiently in line to vote. They know perfectly well that they're targets, should a fratricidal terrorist get past American and Iraqi security. They're targets... but they're there anyway. Steven Den Beste weighs in on Iraq's future; as always, it's well worth reading. And, of course, Iraq the Model's coverage is unbeatable. Omar reports on the pride of Iraqis, enthusiastically explaining who they voted for and why; their breathless excitement is wonderful to see. As Omar says: "Muhaisin Bidairy Abdullah who was born in 1900 and I think he is the oldest amongst the voters came leaning on his grandsons and could hardly breathe with tears visible in his eyes…maybe because he won’t be able to attend the next elections." Wow. I swear, I'll never take a popular election for granted again. I’m a journalist. I read the news everyday, from several sources. I have the luxury of reading stuff newspapers don’t always have room to print. I read every tidbit I could on Iraq and the war before coming. Everything I thought I knew was wrong. But I have a slight hesitation; I need to keep balanced. I can’t be a cheerleader, even if I have a soft spot for the hometown troops, especially after the welcome they’ve shown me. I still need to be truthful and walk the centerline and report the good or bad. But then I realize it’s not a conflict of interest. If I am truly unbiased, then I need to get used to this one simple fact; that the untold story, might in fact, be a positive one. I have a feeling that an awakening is about to occur. Let's check back and see what happens! UPDATE II: Citizen Smash (although these days, calling him res. Lt. Cmdr. Smash seems more appropriate) points out that, had this happened in 1945, the headlines would read VICTORY! And they'd be right. This election was al-Qaeda's last major chance to be relevant in Iraq; they knew it, and we knew it. Had they disrupted the elections in a major way, they'd have been a force to be reckoned with in Iraq for some time to come. But Iraq will now have a popularly elected parliament and government -- and if they pay attention to al-Qaeda at all, it will be as a nuisance, not an existential threat. That headlines today do not read "Victory" says more about the news media than about the subject they're covering. They took a giant step yesterday... and because of it, a fundamental change in American involvement is in sight. It won't be long before American troops are needed in far smaller numbers in Iraq -- due to this successful Iraqi election, and the confidence it builds among Iraqis -- and we'll be able to start bringing some troops home. That's what you wanted, right? Right?